This piece was part of a series of murals created by Shepard Fairey (Obey Giant) under the installation project of the Irvine Contemporary Art Gallery, with other artists including EVOL and PISA73 from Berlin, Gaia and Oliver Vernon from Brooklyn. 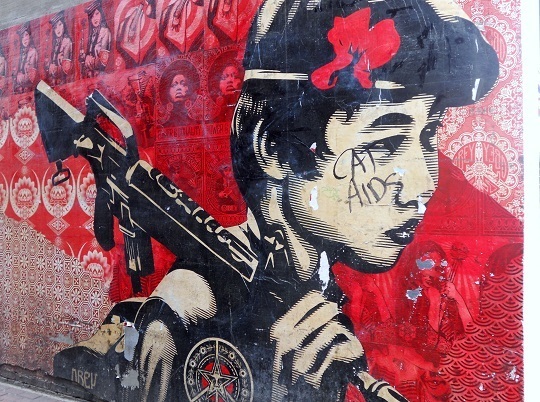 It shows a Cambodian child holding a machine gun over his shoulder, with a flower in his hair highlighting his youth and innocence. The artist created another piece that protested against child soldiers called 'Duality of Humanity' at 4 Pike Street, Cincinnati. This mural was soon destroyed by the building's owner and the above mural no longer exists either.